What Are the Most Suitable Dog Carriers for Shih Tzus? Anyone who owns a Shih Tzu will know that they’re adorable. Compared to other dogs, Shih Tzus are much easier to transport. The best small dog carriers for short trips, car travel, and long flights make traveling even simpler. At only 10 inches tall and weighing less just 16 pounds, ideally you want a Shih Tzu carrier that keeps them safe and comfortable at all times. The good news is there many stylish and comfy options available. There is everything from simple pouches and designer bags which your dog can slip into, to sturdier backpacks and crate-style carriers for added protection on longer journeys. Much will depend on the personality of your Shih Tzu. If they tend to get a little stressed out or anxious, you may be worried about taking them on a long-haul flight or traveling by car to another state. Finding the right carrier will go a long way to ensuring that they stay calm throughout your trip. 1.1 What’s the Best Carry Bag for a Shih Tzu? 1.2 What’s the Best Crate for a Shih Tzu? 1.3 What is the Best Shi Tzu Backpack? 1.4 What Are the Best Shi Tzu Carriers for Flights? Not many people know that the name Shih Tzu means ‘little lion’ and, if you’ve ever had one, you’ll realize, it’s a pretty apt title. Also called chrysanthemum-faced dogs, they are one of the friendliest dogs you could wish to own and they’re great with kids of all ages. It is an agile dog which is why choosing the right Shih Tzu dog carrier is always something to consider carefully. They are affectionate, curious and generally have bags of personality which can, on occasion, verge on the needy. They’ve been around as pets for thousands of years. They originally came from Tibet. They were a target during the Communist Revolution and nearly got wiped out entirely. They ended up coming to the U.S., transported by soldiers who were in China at the time, where the breed began to thrive and recover. Shih Tzus are a favorite celebrity dog. Colin Farrell has one, as does pop diva Beyoncé. The height of an adult Shih Tzu is between 8 and 10 inches, and they can live from 10 to 16 years. 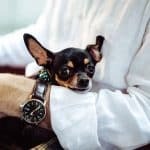 Like many small dogs, they have relatively low exercise needs which is why they tend to get carried more than larger breeds. 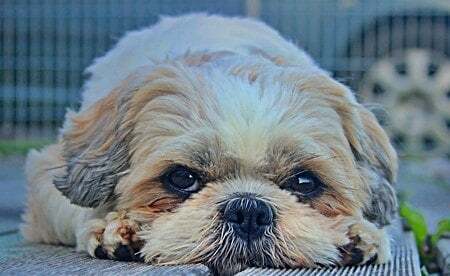 Most Shih Tzus don’t like to be left alone for long periods which can make them unsuitable if everyone is out at work during the day. They are, however, great with people and the perfect dog choice for first-time owners. They do require a good deal of grooming so you will need to be prepared for a little maintenance now and again. They pack a lot of intelligence into such a small body and are quite good watchdogs because they’re quick to bark when there are any signs of disturbance. What’s the Best Carry Bag for a Shih Tzu? Carry bags for small dogs come in a range of different styles. There are those that resemble a cross between a small, portable kennel and hand luggage. Sling bags too are increasingly popular because they’re so easy to wear while still keeping your dog safe. 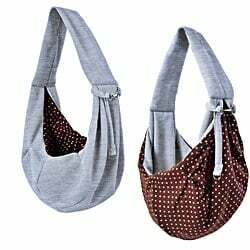 Pouches, on the other hand, provide a snugger fit for dogs and can be worn close to the body. Which you choose will largely depend on whether you need something for a short walk or a long journey. A sling bag is not going to be suitable for traveling on an airplane because there’s a risk of your dog getting free. 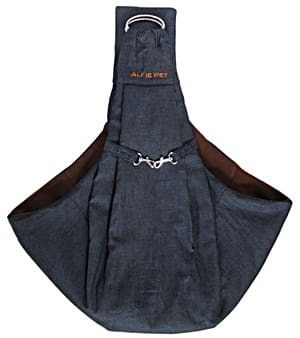 One of our favorites for small dogs is this papoose-style bag that fits simply over the shoulder and is comfortable. Available in a range of colors, it’s the simple way to transport your dog on a daily basis. 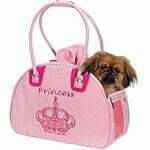 Ideal for dog owners who live in busy cities or towns, this carry bag is perfect for Shih Tzus. The sling is reversible so you can change the design in a matter of seconds. The bag is big enough to hold a Shih Tzu comfortably and has a security clasp to stop them from jumping out. Made from soft, breathable material, it’s a carrier that is easy to clean – put it in the washing machine. Here are some tips on how to clean a soft-sided pet carrier. The Papoose Bag allows you to stay hands-free when outdoors. It’s not a secure dog carrier for temperamental or skittish animals. Not suitable for long journeys or going on flights. This is the kind of carrier that is good for short journeys. If you have a service animal, it keeps your dog close while you remain hands-free. It’s also a good option if you have a dog that is slightly unwell or doesn’t like to be left alone for too long. Find Out About the IPrimio Reversible Pet Papoose Bag on Amazon! If you’re looking for a product that makes a real fashion statement, this sling carrier for small dogs certainly fits the bill. It’s more substantial than the iPrimo Papoose Bag and comes in a variety of colors. With a depth of 9 inches, there’s plenty of room for your Shih Tzu. The shoulder strap can be adjusted easily, and there’s a safety clip for your dog. It has a stylish design that’s easy to clean by simply popping in the washing machine. It can be a little bit bulky for some users. 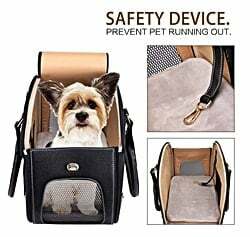 There are many examples of really chic dog carriers online, but you always need to make sure they’re right for your Shih Tzu. It pays to take your time and check out a range of different products that fit the needs of your dog. Find Out About the Alfie Pet Petoga Couture on Amazon! For those who prefer a dog carrier that is a little more traditional, this one from PetsHome has the design of a small handbag and plenty of different colors to choose from. If you’re looking for greater flexibility, this is an excellent option. Made from leather and with a soft, padded interior, it’s perfect for small pooches. Ventilation is provided by mesh windows on all four sides. The foldable design means you can easily store away when not in use. Doesn’t allow you to go hands-free. Zip can be easy for some dogs to open. While these may have gone out of fashion because of sling and pouch dog carriers in recent years, this is a good all-rounder to have in your home. It’s perfect if you’re going on a long journey or need to pop your pooch over the vets safely and securely. Find Out About the PetsHome Dog Carrier Purse on Amazon! What’s the Best Crate for a Shih Tzu? Keeping your dog safe while traveling is something that comes top of the list when considering a pet carrier. That’s why owners often go for something more substantial, particularly when traveling long distances. 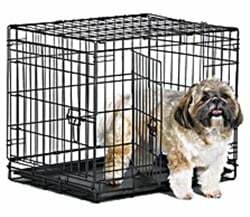 Dog crates are generally sturdier and roomier than other carriers, ideal for small dogs like the Shih Tzu. They come in a variety of styles, and many are suitable for taking on flights or traveling on buses and trains. 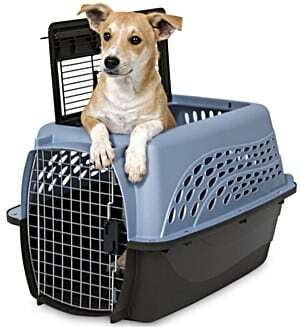 More people are opting for soft material dog crates, and they are great if you are heading out on a long journey. This foldable crate from 2 Pet is excellent for traveling by car as it fits neatly on the seat and keeps your dog safe and secure at the same time. It’s a foldable crate that can be easily stored away. It comes in four different sizes and three different colors. It can be used both indoors and outdoors as a kennel or for transporting your dog. Hand straps make it easy and light to carry for small breeds. It’s less substantial than other dog crates. Dogs that like to chew can damage the mesh. 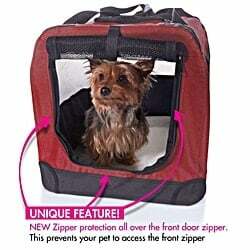 This is a pretty good option if you spend a lot of time traveling and need a crate that your Shih Tzu can learn to love. There’s plenty of room inside, and it’s easy to clean, making it ideal for both indoor and outdoor use. Find Out About the 2Pet Foldable Dog Crate on Amazon! If you are looking for a dog carrier for your Shih Tzu that is a little more hardwearing, the Petmate certainly ticks most of the boxes. It’s more like the traditionally designed carrier you use for taking your pet to the vets but is also suitable for longer journeys. Made of hard plastic, it has plenty of ventilation for your dog. You can load in your Shih Tzu through the front opening or a top door. Ideal for all crate trained small dogs. Easy to clean and sturdy enough for travel. It’s a little more basic than other dog crates on the market. May not be approved for some airlines as it top loads. This is what people usually think of when it comes to suitable dog carriers. The Petmate Two Door Dog Kennel sturdy, functional and does the job that you need it to do. While it’s not as stylish as some other dog carriers on the market, you’ll be able to use for most of your transportation needs. Find Out About the Petmate Two Door Dog Kennel on Amazon! This is ideal if you spend your time traveling by car or campervan and want a safe crate for your small dog. Like the Petmate Kennel, it’s not particularly stylish but certainly delivers on basic functionality. It’s a metal cage-style crate that can be quickly collapsed. A leak-proof plastic tray prevents unhappy accidents in your car. Heavy duty locks ensure your shih tzu is secure inside. A little too bulky for carrying around. This is the archetypical dog crate that you put in the back of your car or on the back seat. It’s weighty and substantial, but the wire frames give your dog all-round visibility. Once your pooch gets used to it, this is a really good crate for heading out to the park. Find Out About the New World Folding Metal Dog Crate on Amazon! What is the Best Shi Tzu Backpack? 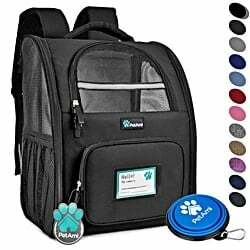 If you want something that is both comfortable and can be used for a wide range of doggie travel needs, a backpack should undoubtedly be on your shopping list. Sturdier and roomier than many sling or pouch style carriers and less substantial than a full-size crate, it’s the perfect in-between product for small dog owners. These are not only ideal for traveling across the country, but they’re also great if you are an avid hiker and want to take your Shih Tzu with you. Small dogs don’t always want to walk all the time and having a suitable carrier is crucial if you are hiking over large distances. The key to a good backpack is that it feels comfortable and gives your Shih Tzu enough room without being too bulky. The backpack from PetAmi delivers on both these fronts. The backpack is well ventilated and suitable for small pets including dogs. The shoulder straps come with decent padding for better comfort. It has a large zipped pocket to store leads and dog treats. Available in more than ten different colors. A little bulkier than some other backpacks on the market. Some people can feel uncomfortable with a backpack because the dog is always facing away from them. Once the dog and the owner get used to it, however, a good backpack is almost indispensable. Especially if you enjoy long hikes, you wonder how you ever lived without one. 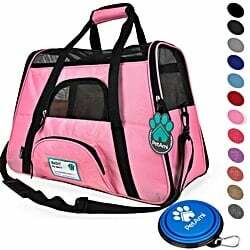 Find Out About the PetAmi Deluxe Pet Carrier Backpack on Amazon! What Are the Best Shi Tzu Carriers for Flights? This is one of the questions we most often get asked when it comes to dog carriers. Many owners, of course, want to have the opportunity of flying with their Shih Tzu in-cabin. Finding a carrier that is compact but secure is high on the list of priorities. The good news is that buying a Shih Tzu airline carrier that meets current specifications is a lot easier nowadays. You should always check with the airline you are flying on that the carrier you have is suitable. Most are designed to be taken on board and fit under the seat. Airlines in the US tend to have their own protocol for taking animals on board. This can relate to the size of the carrier, whether there is adequate ventilation and how secure it is. The key is to choose a carrier that is accepted by most of the airlines which travel internally in the US. On top of that, you need to choose an airline carrier that your Shih Tzu is really going to be happy with. They will, after all, have to sit in it for a good few hours. Here’s our pick of the best on the market at the moment. This is a good hand luggage style, airline approved pet carrier that also has a great design. It combines good functionality with sporty chic and is a comfortable and well-ventilated carrier for smaller dogs like the Shih Tzu. Offered in small and medium sizes with a detachable fleece cover for more comfort. There’s just the right amount of ventilation with wide mesh panels. Lightweight and portable, it comes in a range of different colors. It also comes with a 3-year warranty. Fleece lining could be a little thicker so you may want to replace with your own. The last thing you want is to invest in an airline dog carrier and find that your flight isn’t going to accept it. That’s why doing your research is a good idea beforehand. The good news is that most US internal airlines are becoming more uniform in what they do and don’t accept. Find Out About the EliteField Soft-Sided Pet Carrier on Amazon! For those searching for a stylish bag style carrier that is suitable for most flights, the PetAmi is well ventilated and has plenty of different safety features. It’s available in a broad range of different colors. Ventilation is provided through the mesh on the sides, front and top of the carrier. It has a good safety strap and safety buckle zippers so your Shih Tzu is kept secure. There’s a detachable strap for over the shoulder, sports style carrying. Soft bedding lining can be a little thin for some dogs. This is a highly functional airline carrier that is suitable for most flights in the US. It’s pretty easy to clean and a durable, all-purpose dog carrier that you’ll use again and again for lots of different purposes. Find Out About the PetAmi Soft Side Travel Carrier on Amazon! The first thing you always want to do before buying any carrier for your Shih Tzu is making sure that it’s a comfortable fit. As dogs are den animals, you want a space that is not too big so that they’re rocking around and not too small and they don’t have enough room to turn. 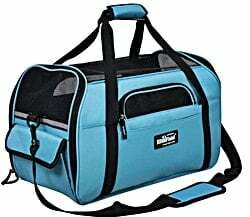 Manufacturers suggest taking two main measurements and then choosing your dog carrier based on these. The first is measuring from the top of the head to the floor while in a standing position. Ideally, you want the height of your dog carrier to be about 2 inches above that. The second measurement is from the nose to the base of the tail. The ideal dog carrier should be four to six inches more than this. Of course, much will depend on whether you are choosing a traditional style dog carrier or a product such as a backpack. These tend to be used for longer traveling such as hiking or going on a flight. Slings and pouches are designed to wrap around and cradle your Shih Tzu which is why they are more suited for shorter distances. Whatever dog carrier you select for your Shih Tzu, the next problem you will have is getting them used to be carried around in it. For some dogs, this is easier than others! The personality of your Shih Tzu is going to largely determine how quickly they get used to your new dog carrier. Most experts suggest taking it slowly. If you are planning on using your carrier for traveling a long distance, it pays to start getting your dog acclimatized at least a couple of weeks before you are due to leave. For those owners who have a crate or traditional kennel-style dog carrier, putting this in a familiar place and opening the door should encourage the dog to go inside. If they are a little reticent, you can use treats to entice them in. It’s all about making this a secure environment for your dog. The big challenge, of course, is going to be when you close the door and pick up the dog carrier. Again, you should do this in small doses at first and give your Shih Tzu plenty of encouragement and treats. Pouch or sling-style dog carriers are a little different. Wearing the carrier when you sit down at home and encouraging your dog to jump inside when you cuddle up is one way to get them used to it. After a while, you can then walk around the house before trying outdoors for the first time. Always make sure that you choose a dog carrier like a pouch which comes with a clasp for attaching the lead (most do nowadays). That should prevent your dog from getting too excited and trying to jump out of the pouch. The great news is that there are a lot of options and you can easily find the best dog carrier for a Shih Tzu. We hope our list of favorites has given you a great place to start.